Above: Michael Purches holds a watercolour by Hildred Harpin, a noted painter, teacher, writer and priest, whose home was at Swartha from 1936 until 1957, when he left to study for the priesthood in Rome. Michael has lived for nearly 50 years in the Swartha cottage that belonged to the artist, and the newly-purchased work looks towards the Nab from the back of Swartha Cottages. A textile designer, Michael worked locally for Stocks's, where he met his late wife Marian, but went into teaching after the mill closures of the 1970s. He joined Greenhead School in 1979 and became head of French until retiring in 2002. Above: another Harpin painting. This view of the gable end of No. 6 Swartha Cottages looking towards Swartha Farm is dated 1944. It is one of six Harpin paintings collected over the years by Michael Purches, whose latest acquisition, with which he is pictured in the first photograph, was among 62 Harpins recently offered for sale online by Sulis Fine Art (www.sulisfineart.com) along with two works by Hildred's father, Edgar. Sulis bought the paintings at auction. It is not known why so many suddenly became available. Sulis was offering the unframed works for between £9 and £34. Nearly half were swiftly sold. 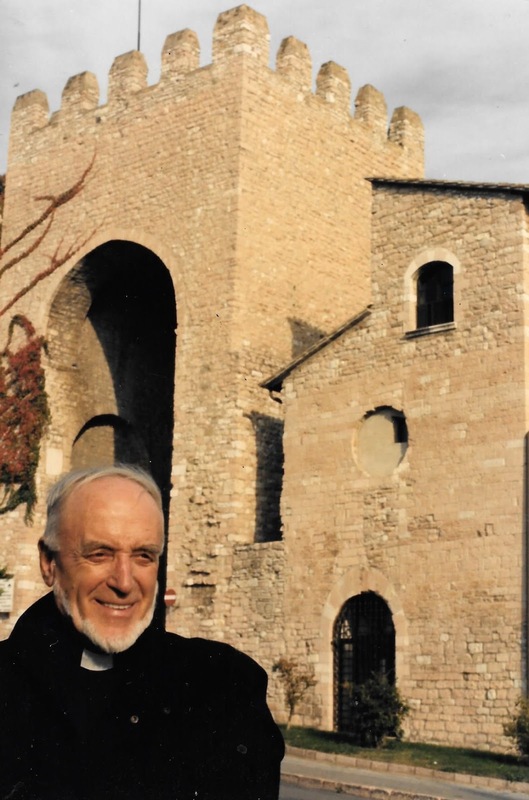 Above: Hildred 'Harry' Harpin pictured aged 80 at St Peter's Gate in Assisi in 1987. He died in Assisi on October 5th that year, the day after celebrating the feast of St Francis. Born at Marsden, near Huddersfield, in 1907, Hildred was a graduate of the Royal College of Art. He taught art at Keighley Boys Grammar School and became acting principal of Keighley School of Art. He was elected to Silsden Urban District council in 1955. From a nonconformist family, he had converted to Catholicism in 1928. After studying for the priesthood at Beda College in Rome, he was ordained at Carmarthen in Wales in 1961. He later became a chaplain in Assisi, where he spent the last 18 years of his life. 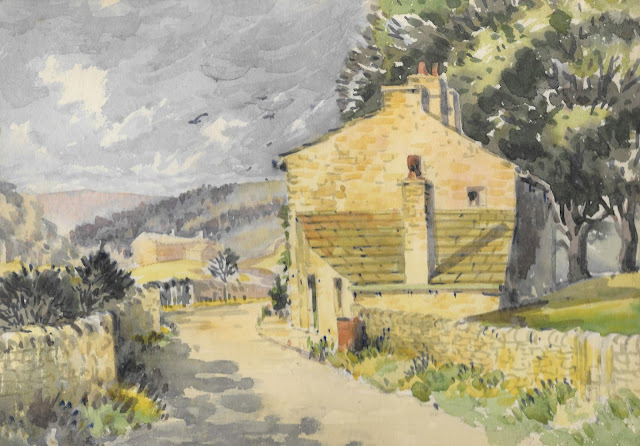 Information about Hildred and other artists from the Bradford district can be viewed at notjusthockney.info, a website run by Colin Neville, of Silsden. Aspects of Swartha featured in my posts of January 22nd 2017 and February 7th 2015.